Deep Pot Magnets are Magnetic Holding Assemblies for use where a very strong surface holding magnet is required. The magnet sits inside a steel case which provides extra strong magnetism on one face only, provides a hole for fixing and also protects the magnet from damage. One of the largest usages of magnets is the application of holding or gripping, the basic principle of the holding or pot magnet is to direct and concentrate the flux from both magnetic poles to one active face. This is usually achieved with steel pole pieces or a steel (brass)-backing cup. 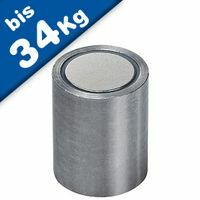 Alnico deep pot magnet is a deep cylindrical permanent magnet which are assembled in a mild steel pot using spacers like Aluminum or Brass(Copper). 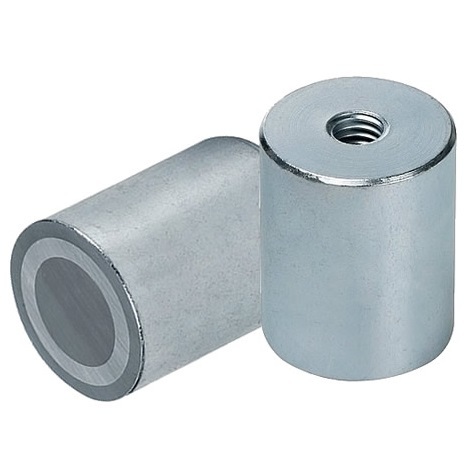 The working temperature of this magnet is around 220° C. Outer surface except pole can be either painted or coated with Zinc, Nickel or Chrome. Assembly of the magnet and correct spacing are achieved by the use force-fitted aluminium ring. While working above 200°C, precaution must be taken of possible mechanical loosening through expansion and contraction of the component parts. NdFeB deep pot magnet is a deep cylindrical permanent magnet which are assembled in a mild steel pot using spacers like Aluminum or Brass. 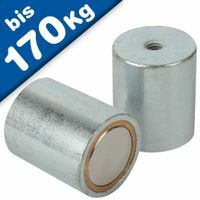 The working temperature of this magnet is around 80° C / 176°F. Outer surface except pole can be either painted or coated with Zinc, Galvanized, Nickel or Chrome. 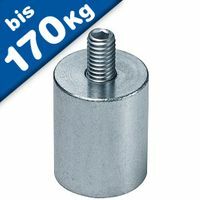 Assembly of the magnet and correct spacing are achieved by the use force-fitted aluminium ring. NdFeB Pot Magnets are best for maximum pull strength with a small size. 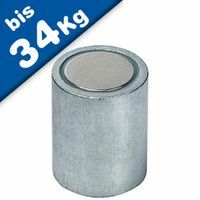 Samarium-Cobalt deep pot magnet is a deep cylindrical permanent magnet which are assembled in a mild steel pot using spacers like Aluminum or Brass. 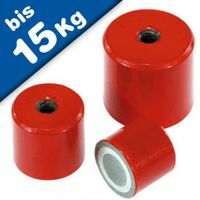 The working temperature of this magnet is around 300° C. Outer surface except pole can be either painted or coated with Zinc, Galvanized, Nickel or Chrome. Assembly of the magnet and correct spacing are achieved by the use force-fitted aluminium ring. Samarium-Cobalt (SmCo5 and Sm2Co17) Pot Magnets have high resistance demagnetization, good temperature physical properties and well resistance of corrosion. Who supplies high quality Pot Holding Magnets magnets? Magnosphere offers best priced Pot Holding Magnets magnets globally to all industries, including Automotive, Aerospace, Military, Advertising, Design House, Electronic and Academic/R&D. Please inquire for custom Neodymium magnets or magnetic assembly. Buy Pot Holding Magnets magnets at Magnosphere and get a better deal!